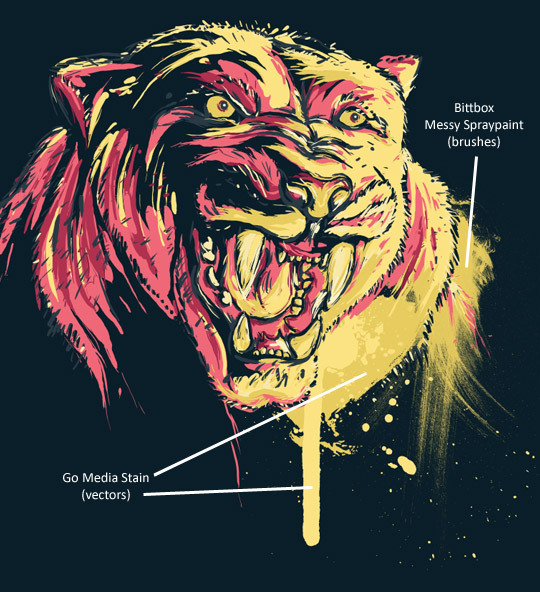 Apart from shamelessly promoting myself, I’m going to show you how to create a poster of this new and improved pink panther using some great online resources, from Bittbox and the Go Media Arsenal. You can use just about any version of Photoshop and will need to brush up your art skills for this poster with a pen tablet. First of all, download the sample file below & follow along with me in Photoshop. It’s got more than 100 layers, so you’ll really be able to see how this was put together. Indeed, you are looking at a tiger photo, not a panther. 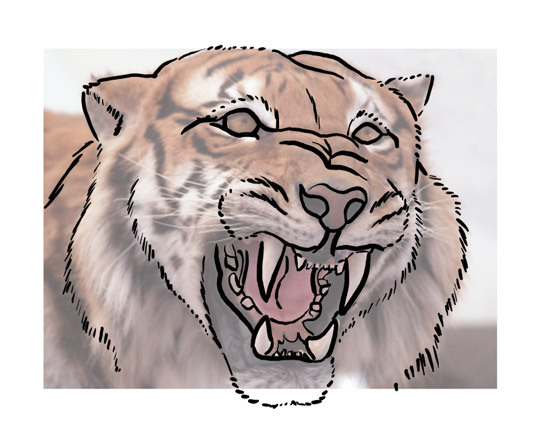 I know my English and Zoology well enough to tell the difference, but I found a tiger’s fur much more fit for this particular design. Not only that, but those huge fangs are just SO cool. So, get this image from istockphoto and position it accordingly in your newly created A3 canvas at 300 ppi. You’re going to need a pen tablet at this point, so use a regular round brush with pen pressure enabled. Begin by tracing the general outline with black. Later on, we’ll fill the strokes with paint sprays of different colors. 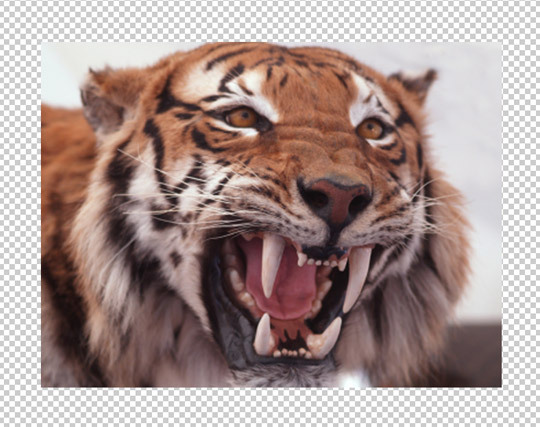 Change the tiger photo’s Opacity to about 60%. That will make drawing easier. Try to give the dark outline a depth of field through stroke width. On a pen tablet, the harder you press, the thicker the line. So by drawing parts of the face with more pressure, you’ll get more obvious and visually imposing features. 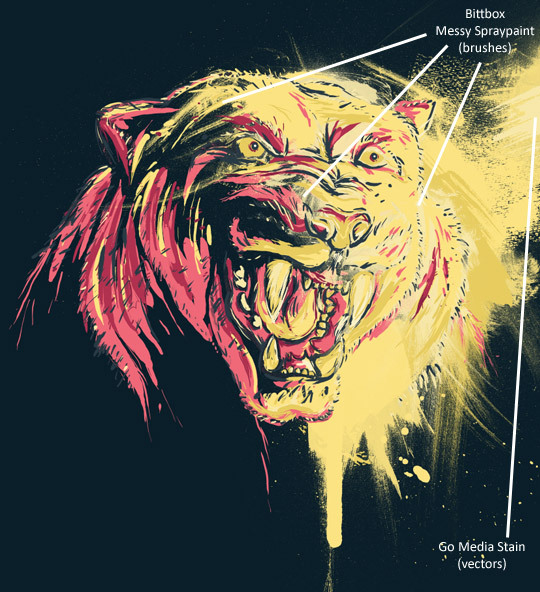 In this drawing, we want to draw attention to parts that show a fierce, angry panther. 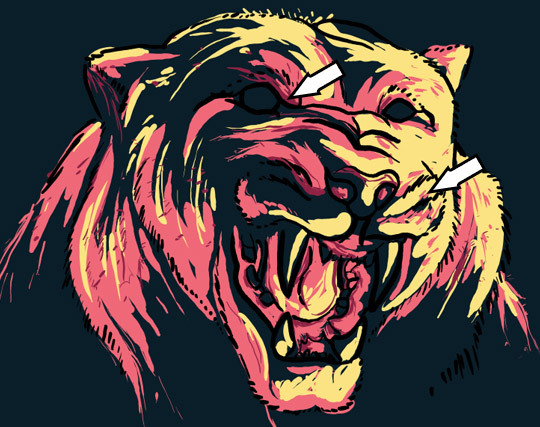 To do that, draw the fangs, jaw outline, eyes and wrinkles with a thicker line. These are the features we want to point out, and the emotion we want to generate. Now add a few accents to the face. It’s a good idea to keep altering the visibility of the photo so that you get a general idea of what the new art will look like, while still keeping the photo as a reference. Use a shade of pink for this layer (ef6878) and make individual layers for each color, or even for different stroke widths of the same color. You’ll probably change your mind later on some of the lines, and it’s not worth having to redraw everything. 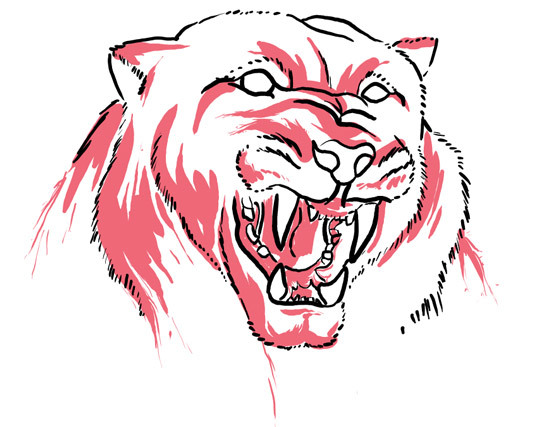 While drawing the pink strokes, think of them as the first step to defining the lighting and actual features of the feline. The mouth is almost completely painted because it’s not only a pink area in real life, but because we want it to appear darker. Also, instead of painting the whole left side with pink, we’ll draw strokes that fade in and out (through line thickness). That will give the face a particular texture, and avoid giving the impression of a flat surface. It’s not a finished effect, but will work once we have all the other layers finished. We’ll now get started with the highlights. It’s a good idea to change the background color right now too. Fill the background with this blue: 0a1e29. And use this yellow for the highlights: fbe382. As if complementing the pink layer, draw the yellow highlights in largely unoccupied areas. 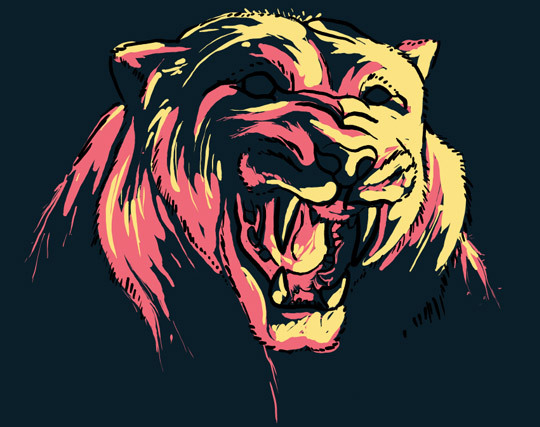 Try not to cover much of the pink, and imagine how a bright yellow light from the right would highlight the animal’s fur. Don’t leave the left side completely dark, but remember that fur generally absorbs light and doesn’t really reflect it. For artistic reasons, the light is exaggerated, but serves the style and purpose of the design. We want edgy and bold contrast that goes with the kitty’s bad temper. Two more layers. One containing a darker shade of pink (b0314f), and one of the previously used lighter pink. Firstly, make a new layer over the yellow one, and paint thin, short strokes on top of yellow areas. Those will add texture, and add small shadows to the lit side. Also, make one more layer for the darker pink and use it to darken pink areas, not yellow ones. These act as more profound shadows and will act as a transition from pink to background blue. Double click on the black outline layer. 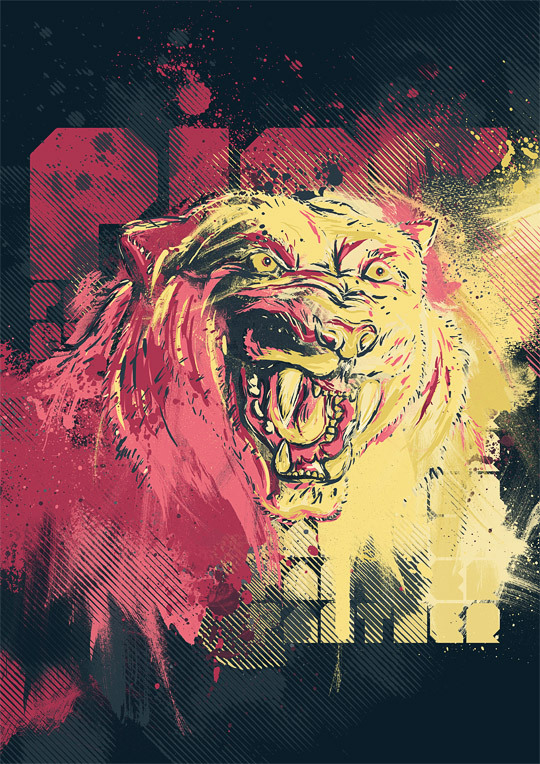 Add a Color Overlay Layer Style. Choose the background color. That will basically make it fade into the background. Also, add more accents of the darker pink and of the lighter one, just like in the previous step. Fill the eyes with a bolder yellow (e7cc5f). That will not only bring more attention to the eyes, but will later be used over the yellow covered side to create depth and texture. Add dark accents of this bluish gray: 293a44. We’re doing this in order to differentiate distinct facial features, and to be able to make an easier transition into the background, as well as paint details. Also, add the pupils using the same gray, and dark pink rings. Bring out some of that beautiful fur with stubble-like strands. 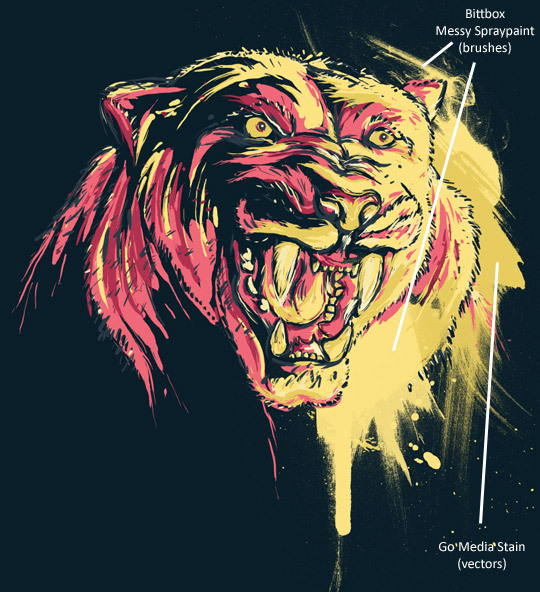 This effect is simply meant to make the fur look more dynamic. Also in order to add more depth to the lit side, add even lighter accents with this yellow: f7e2a8. Finally, select the darker yellow found in the eyes and paint over yellow areas. Make sure that you only paint on the left side of all lighter yellow strokes. That’s it for the panther, so let’s get on with the next section. It’s time for some messy artwork. 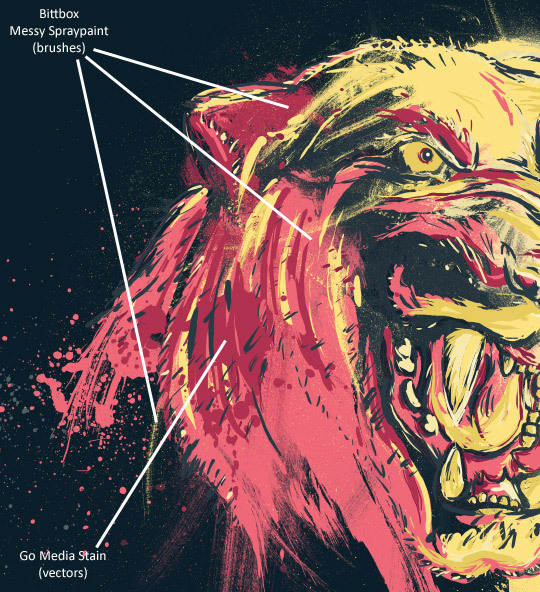 In this section, you’ll need two resources: Bittbox Messy Spraypaint brush set and Go Media’s Stain Photoshop Brushes. From now on, it’s all trial and error, so you will most likely be moving things around in time. When using brushes, I suggest you paint inside the canvas and manually position it. The head is basically just floating on the canvas, and it’s not the result we’re looking for. It’s time to create a transition from side to side of the document, using artistic elements found in the links written above. To blend in the face, we’ll not only add paint elements behind the face, but also inside the face. Doing otherwise, will make the transition less subtle. While placing the vectors and brushes, keep a general orientation in mind, because we want this to be well built from a compositional point of view as well. The paint will appear as a diagonally oriented line, starting near the source of light and ending in the darker side of the canvas. It is also further down than up, because we want the piece to have a certain stability and foundation. If it would be heavier on the top, it would create a floating sensation. There’s lots of material to read on Composition, and as a foundation to this sort of work, i suggest you read on that topic, if you haven’t already. As previously mentioned, the Project File would be most useful in this case. Because the splatters and stains are kept on separate layers, it will be easier for you to keep track of all the changes seen in the screenshots below. Add more yellow stains and spray paint. I also placed a Bittbox spray paint over the Go Media dripping stain because I wanted to make its edges less defined. 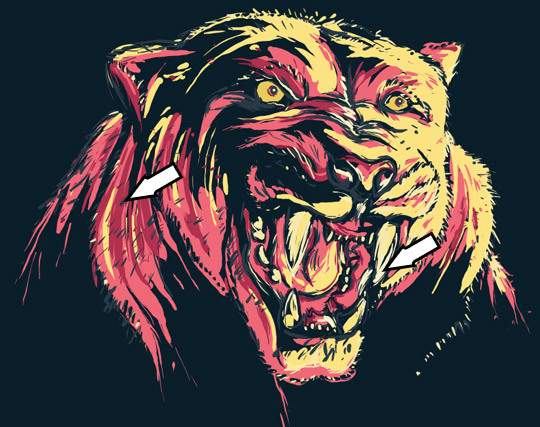 It’s a good idea to do that with most vectors in this piece, since we’re trying to create a smoother transition. In a similar manner, add more stains and spray paint. We’re already defining a general orientation, as you can probably see. As mentioned before, we’ll fill the dark face outline with messy spray paint. 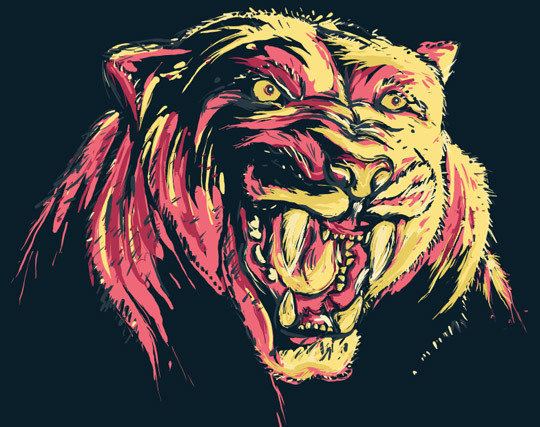 Select the dark outline layer of the panther’s face. Because the layer has a color overlay, you’ll need to flatten the effect. 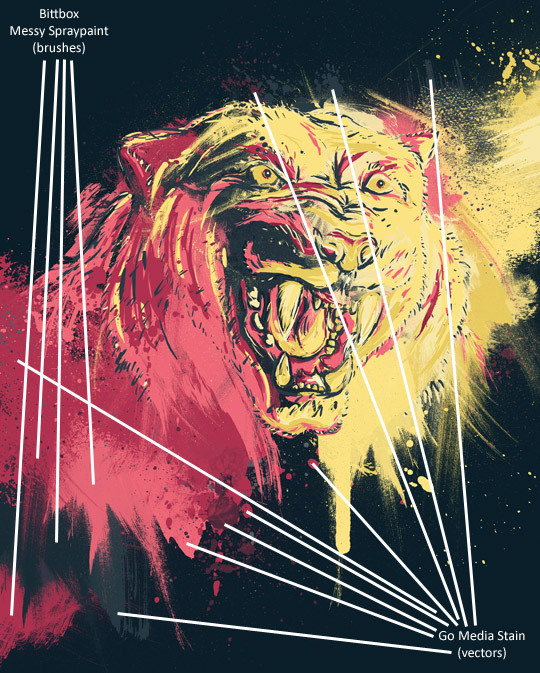 Create a new blank layer, select both layers and merge them (Ctrl + E). 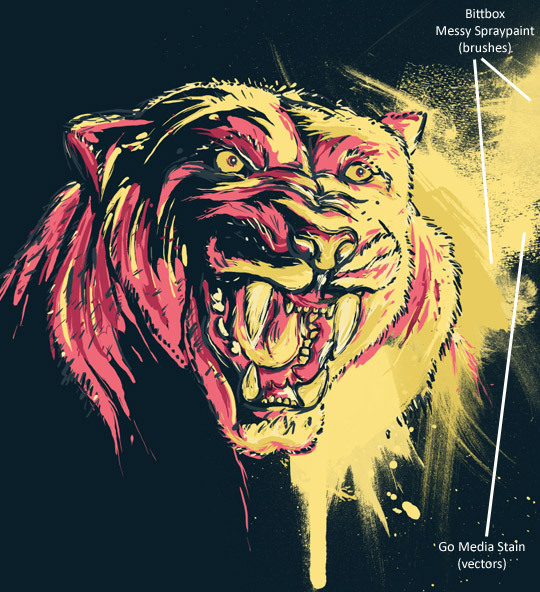 Now create another layer, make it a clipping mask and while using a messy spray paint brush, paint yellow sprays on the lit side of the face. 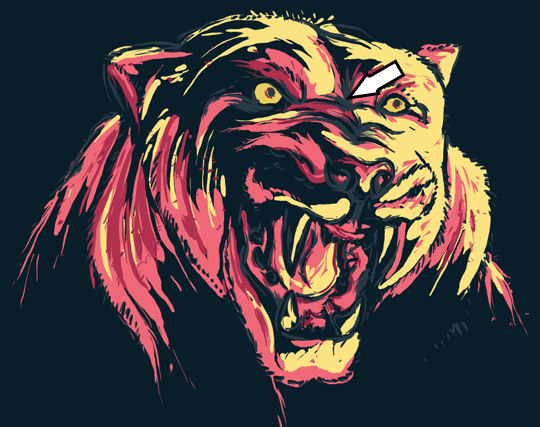 Also, paint two more yellow sprays behind the face; you can see them near the eyes- they appear as horizontal streams. 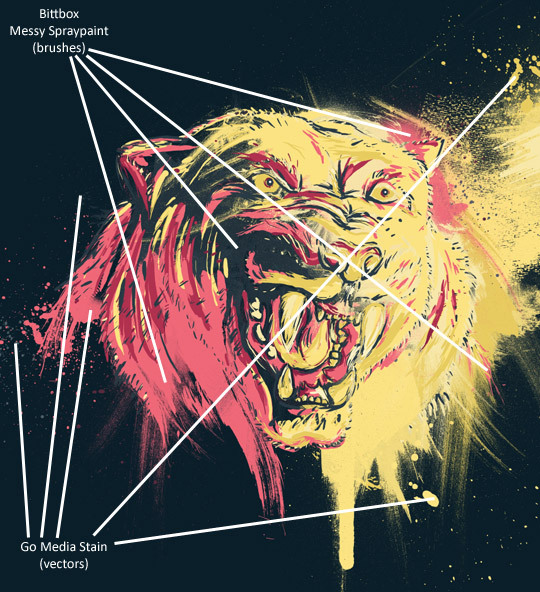 Add ink-like splatter vectors to different areas of the canvas using existing colors – yellow, pink and bluish gray. Also, begin adding pink accents of spray paint. Add some more splatters and paint with pink. I also cut out a small stream from a spray paint brush, and applied it the left side of the face. It’s pointed out with the first white line on the left, as a Bittbox brush. Next, continue the red section and add more splatters too. Mix splatters, paint stains and paint sprays, just as you did on the right side. I also added a couple of grayish stains so that the stream becomes visibly darker. Now you’ll need the Abstract Halftone brush pack. Using a bluish gray (243941) fill the background with a 45° angled line halftone brush. Make sure that the halftones are well aligned, so that it gives the impression that they are simply changing color, not crisscrossing or mismatching. Position these in the unoccupied, or whitespace of the canvas. And now add some background colored halftones. That will simply fade out some of the elements. 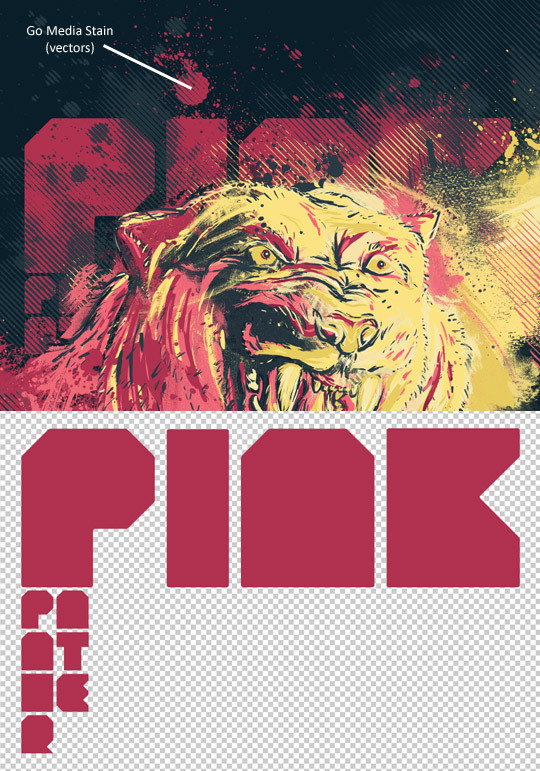 I also added a pink halftone on the right side, just barely visible. You need this font for the final part. Download it, and type in the words in a similar way. 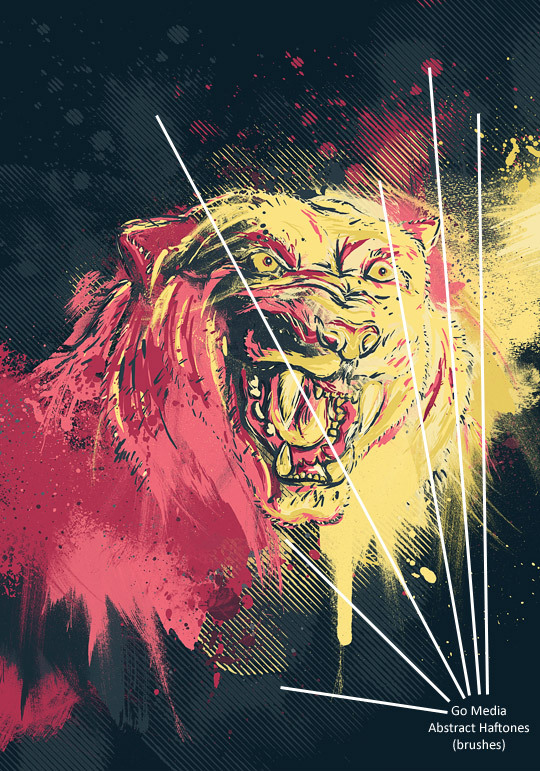 Place them behind all the layers, including the halftones. You’ll notice that the final block of text, both pink and yellow, forms a rectangle. This is meant to bring a certain order and predictability to the layout of the design. It acts as an anchor that keeps all the elements in place. Also, readability is not a main objective here, so neither the font, its layout or modifications are meant to serve that purpose. It has a more graphic role. 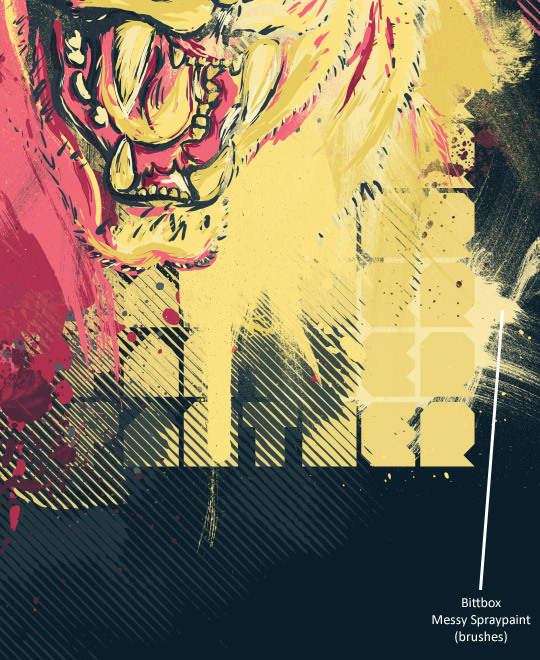 Now, while using the light yellow color, type the word panther repeatedly in the lower right corner in order the complete the rectangle grid. Also, add a lighter colored spray paint that will eliminate some of the negative space of the text. And as a last touch to the text, make a selection of all the text by holding Ctrl + Shift and clicking on all the text layer icons. Make a new layer above, and spray paint with a light yellow. That will make the text appear less flat. 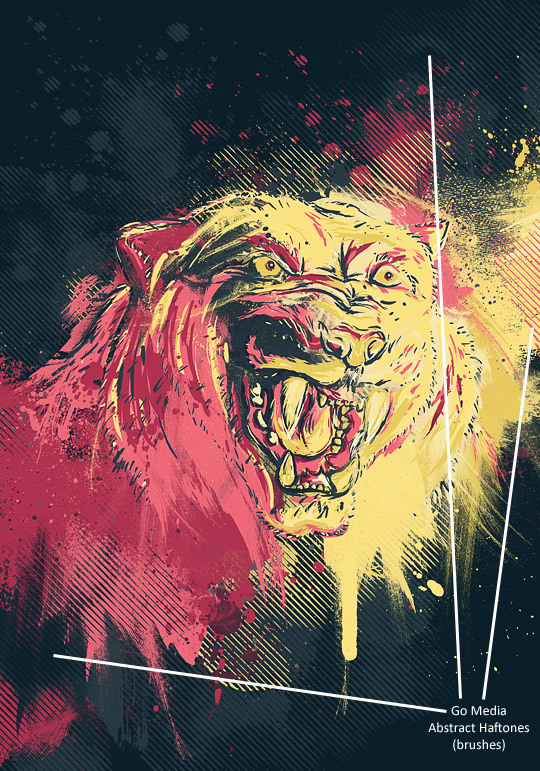 And with that, we’ve just finished creating a furious pink panther poster using only a few messy spray paint brushes, abstract halftones and splatter vectors. It’s situations like these where brushes and vectors prove their worth. Now use them to make your own furious design!